Conclusions – last 40 years nothing out of the ordinary. Probability of global cooling until 2080. Last 2,500 years studied- tree rings, stalagmites, sediment cores. No trace of adverse effects from CO2 concentration. Globe may cool to 1870 levels. The Die kalte Sonne site here features a worrisome essay by German climate scientists Horst-Joachim Lüdecke, Dr. Alexander Hempelmann and Carl Otto Weiss. They carefully examined climate changes of the past and have found that the recent changes (of the last 40 years are nothing out of the ordinary and that we need to worry about a global cooling that will persist until 2080. They published 2 papers on the subject in the journal European Geophysical Union (EGU) , . According to the 2 scientists, climate is often cyclic. The first study appeared in February 2013 and it examined six of the longest existing thermometer data series recorded in Europe, as well as one dataset from an Antarctic ice core and another from a data series extracted from stalagmites. The datasets were covered the period of 1757 – 2010. The second publication appeared in February 2015 and it examines the past 2500 years. The analysis of the past 2500 years involved data from tree rings, sediment cores, stalagmites, etc. A plot of the data yields a climate operating with cyclic behavior. 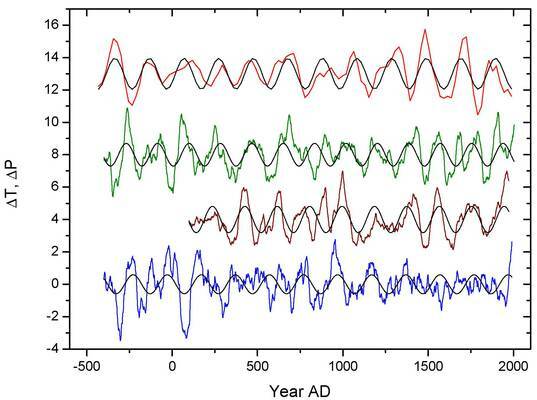 Figure 1: Temperature changes of the past 2500 years (with linear regression). Figure 2: Sinusoidal representation of solar activity and 3 proxy datasets. 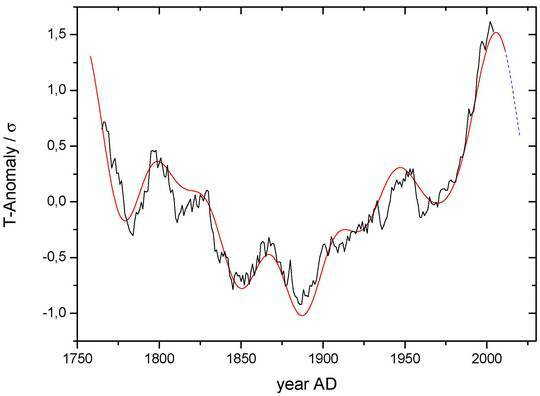 Red: solar activity using 10Be proxy, Sine period = 208 years, correlation 0.68. Green: Büntgen data series , Sine period= 186 years, correlation 0.49. Brown: Christiansen/Ljungqvist data series , sine period = 189 years, correlation 0.58. Blue: Cook data series , sine period= 201 years, correlation 0.41. 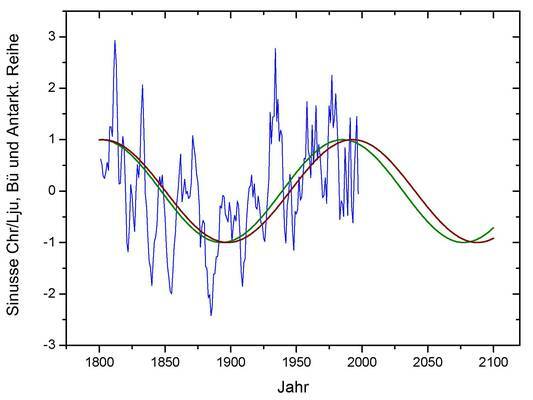 The German scientists write that one result of the well established cyclic behavior over the past 2500 years is that it is justified to assume that the De Vries / Suess solar cycle will continue in the future. They write that this means that “global cooling is to be expected over the next 60 years (Figure 3)“. Figure 3: Sinusoidal behavior shown from the datasets by Christiansen/Ljungqvist  (brown) and Büntgen  (green) together with the Antarctic series  (blue) confirms that the De Vries / Suess cycle acts globally and that cooling is to be expected for the future. 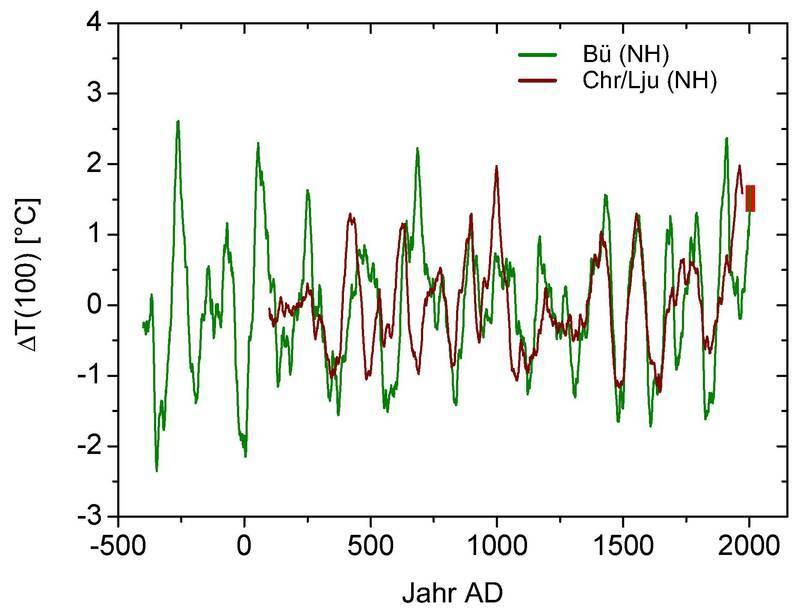 Lüdecke, Hempelmann and Weiss also examined the oldest existing thermometer datasets going back some 250 years  taken at the locations of Kremsmünster, Vienna, Prague, Hohenpeißenberg, Munich and Paris. Their study also included ice cores and stalagmite datasets, which the scientists say “show exclusively periodic climate changes in fine detail. There is no trace of aperiodic effects, such as from the continuously rising CO2 concentration in the atmosphere (Figure 4). Figure 4: Central Europe temperature (black, smoothed, agrees with the Antarctic temperatures) and the sum of the 6 strongest cycles (red), as found with the cycle analysis of the black curve. The perfect agreement between red and black shows that non-cyclic impacts (such as the steadily increasing atmospheric CO2) play no role for the temperature. Only the cycles correctly reflect the measured temperatures. Polar Bears! You guys are going to be OK . . .
Globe may cool to 1870 levels! The scientists add that the “pause“ in global warming is caused by the AMO/PDO, which has been on the decline since 2000. The De Vries / Suess solar cycle allows a general cooling up to the year 2080 to be predicted and that the global temperature will reach a level last seen in 1870. Strong doubts will certainly be fired at the findings by Lüdecke, Hempelmann and Weiss. But they remind us that in the solar physics literature other authors have already used their findings and arrive at practically the same conclusions (see the footnotes at the end of their two papers). The three German scientists sharply criticize the IPCC for refusing to acknowledge the sun as an obvious driver of the global climate. Finally the German scientists say that in view of the increase in CO2 seen thus far, 50% of the temperature increase expected to happen by 2100 should have taken place by now – if such a CO2 warming were true. The scientists say that the way things stand now, if the CO2 effect were real, the future warming up to the year 2100 could be at most 0.7 °C.